In his capacity as Professor of Music Theory at the Vienna Conservatory, Robert Fuchs taught many notable composers, including Mahler, Sibelius and Richard Strauss, and was highly-regarded in the latter capacity during his lifetime. However, the reason his compositions didn’t become better known was largely down to the fact that he did little to promote them, living a quiet life in the Austrian capital, and refusing to arrange concerts even when opportunities arose. He certainly had his admirers, among them Brahms, who almost never praised the work of other composers. Brahms wrote: ‘Fuchs is a splendid musician, everything is so fine and so skilful, so charmingly invented, that one is always pleased’. Various conductors championed his orchestral works, but his chamber music was considered his finest oeuvre. During his lifetime, his best-known works were his five Serenades, their popularity being so great that Fuchs acquired the nickname ‘Serenaden-Fuchs’ (roughly translated as ‘Serenader Fuchs’). The present CD represents the second co-production between the TYXart label, and the new Joachim Wollenweber Edition that seeks to re-focus public attention on forgotten composers of the classical and romantic periods. Irrespective of Fuchs’s popularity per se, the three works recorded here bring the viola into prominence. In the case of the Trio in F sharp minor we are offered the relatively rare opportunity to hear a piano trio that eschews the regular piano – violin – cello combination, substituting the latter for the viola, an instrument pitched exactly an octave higher. Other composers wrote for this revised instrumentation, but, to a man, they also fit into the less-well-known list of composers, such as Lachner, Philipp Scharwenka and Thomas Dunhill, with Reger and Bax arguably the best-known exceptions. The Trio was completed in 1921, and is, in fact, the composer’s third piano trio. 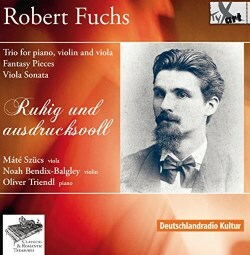 The first two were written for the conventional piano-trio format, but while Fuchs was probably aware of Reger’s early Trio in B minor (1891) – which substitutes viola for cello – it is unlikely that Fuchs garnered any real ideas from it. The opening ‘Allegro molto moderato’ is a pleasantly lyrical and yearning confection, with a rhythmically engaging first-subject that might well have come from the pen of Dvořák. The texture is noticeably lighter than those piano trios where the cello is the bass instrument, but here, the lower octave of the piano assumes the role as effectively, and there is now greater transparency at the bottom end of the harmony. The ensuing ‘Andante grazioso’ has an easy-going feel to it. That said, I wouldn’t use ‘playful’ to describe it – as Christian Heindl does in the quite-extensive sleeve notes – especially with its, at times, darker hues. The ‘Allegretto scherzando – Vivace’ provides the customary scherzo movement. This, too, has a more serious vein running through it, until the ‘Vivace’ is reached, where the earlier triple meter gives way to a faster section in duple time – Viennese Waltz becomes Polka, so to speak. Here the writing is delightfully light and airy, and where the bass line of the piano, rather than cello in its absence, keeps everything on a pleasantly nimble footing. The triple time returns briefly, allowing a short hint of the faster duple meter to round the movement off effectively. The finale (Allegro giusto) combines vigour and expression, in a movement where, this time it’s some of the piano figuration that calls Dvořák to mind again, in tandem with the quasi-Hungarian-Czech dance-like feel of Fuchs’ invention. Predominantly a work that favours minor tonalities, it still manages to summon up sufficient energy to conclude in the major key, after a short ‘accelerando’ to the finish. The next work on the CD – Six Fantasy Pieces, Op. 117 – presents a popular form at the time, the so-called ‘Phantasiestücke’, or ‘Fantasy Pieces’, a genre made famous by Schumann, and inspired by the 1814 collection of novellas, ‘Fantasiestücke in Callots Manier’ by one of his favourite authors, E.T.A. Hoffmann. Fuchs’ set was published for the first time in 1927, the year of his death, and possibly written only shortly before this. The opening ‘Ländler Tempo’ is cast more as an introspective and sophisticated medium-paced Viennese Waltz, than anything that might attest to the Ländler’s folk-like beginnings. ‘Ruhig und ausdrucksvoll’, as the tempo indication implies, is calm and expressive in its outer sections, but with a significantly more troubled middle section. ‘Leicht bewegt’ (with nimble movement) once more is self-explicit, again conceived in a tripartite form, where the middle section again has greater rhythmic and melodic impulse. ‘Andante sostenuto con espressione’ combines an almost Mendelssohnian sugariness with a little more substance à la Brahms – a musical ‘sweet & sour’ experience, but finely balanced in terms of the respective ingredients. The fifth piece, ‘Mäßig bewegt’, translates better as ‘moderato, than Heindl’s suggestion of ‘Walking Pace’ – usually the equivalent to the Italian ‘Andante’, and would be more accurately rendered in German by ‘gehend’. It is set in the style of a lugubrious waltz, where the low tessitura of the viola part almost suggests a piece for cello and piano, rather than viola. Formally it once more adheres to the customary ternary (ABA) design, though with a somewhat more uplifting last few bars. The set ends with ‘Allegretto con delicatezza’ – a simple design of classical rather than romantic persuasion. The contrasting middle section in the minor key does introduce some darker and more expressive hues, before a return to the simplicity of the start. However, Fuchs includes a more passionate, chromatic passage almost at the end, and the piece, and set as a whole, comes to a suitably vigorously close. The CD ends with the Sonata for Viola and Piano in D minor, Op. 86, completed in the autumn of 1899, is eminently more substantial than the six short pieces that precede it. It opens with a broad ‘Allegro moderato, ma passionato’, with a sinuous melody bathed in chromatically-shifting harmony. Fuchs, the teacher, still asks for the conventional and somewhat pedantic repeat of the exposition, before launching into the more adventurous development section, where imitation between the two instruments again attests to the composer’s academic standpoint. Throughout this section, thematic development has been more measured, than dramatic, but there is still room for a passionate moment just before the close, which ends quietly in the tonic major. This is a three-movement work, and the ensuing ‘Andante grazioso’ functions as a minuet/scherzo, albeit not overtly rapid. Elements of Brahms can be discerned, as the two instruments echo each other. The ‘trio’ does come as a surprise, and almost feels isolated from the two sections that envelop it, with its frequent pizzicati from the viola and abrupt change to D major, from the ‘Andante’s’ starting key of B flat major. Despite this, however, this is certainly one of the more charming moments of the whole sonata. The reprise follows the same route home, but adds a decisive perfect cadence to round it off seemingly to achieve greater effect. The ‘Allegro vivace’ finale doesn’t really start out that memorably, with quite an ordinary little tune to work on. There are some fireworks from both players midway through and just before the main theme returns. With just under two minutes to run, the tonic major (D) begins to establish itself, as a return to the figuration heard at the start of the movement is made, but now built up sufficiently to provide a wholly satisfying coda that finishes the work off to good effect. The playing and recording are first-rate, so it’s really just a question of deciding whether Robert Fuchs, on the evidence of these three chamber works, has made a sufficient case to warrant inclusion in the Joseph Wollenweber Edition. If it were down to Fuchs’ apparent diffident style of self-promotion, these works would probably remain largely unknown and rarely played. However, first and foremost each piece is a well-constructed essay for a combination that isn’t exactly haemorrhaging stable-mates. The Trio and Sonata are both well put-together, and show real empathy for the instruments involved; the Fantasy Pieces are interesting, varied and could sit well in a recital. If that’s still not enough, then there is definitely an allure in his writing, and one which, while obviously derivative of the period, exhibits enough individual charm to sustain it. In my book you can never overdose on such eminently tuneful and attractive music from the likes of Robert Fuchs and his contemporaries but not everyone will possess such a sweet tooth.